The Master's Hammer and Chisel is an innovative resistance-training system built on Sagi and Autumn's own muscle-sculpting methods. You'll perform challenging workouts that incorporate SSP Training—short for Stabilization, Strength, and Power—to rapidly build, sculpt, and refine your physique in just 30-40 minutes per day. This program is for intermediate and advanced fitness enthusiasts. You save over $115 with this pack compared to buying each item separately. Limited time only! That means when you buy The Master's Hammer and Chisel and Shakeology in this Challenge Pack, it's like getting The Master's Hammer and Chisel for just $30! I'll be with you every step of the way helping you make the most of your 60 day transformation. 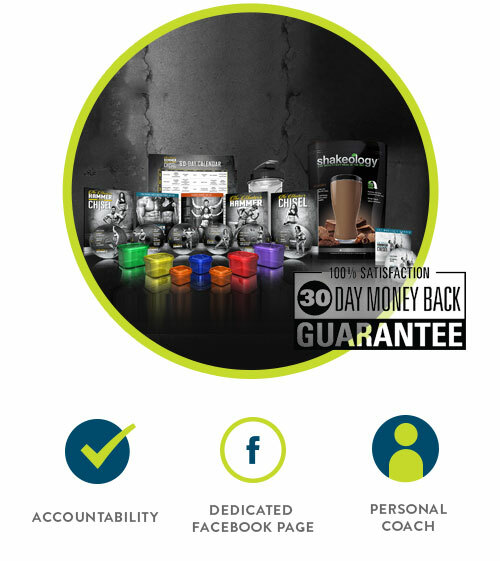 Click below to order your kit and start your challenge!